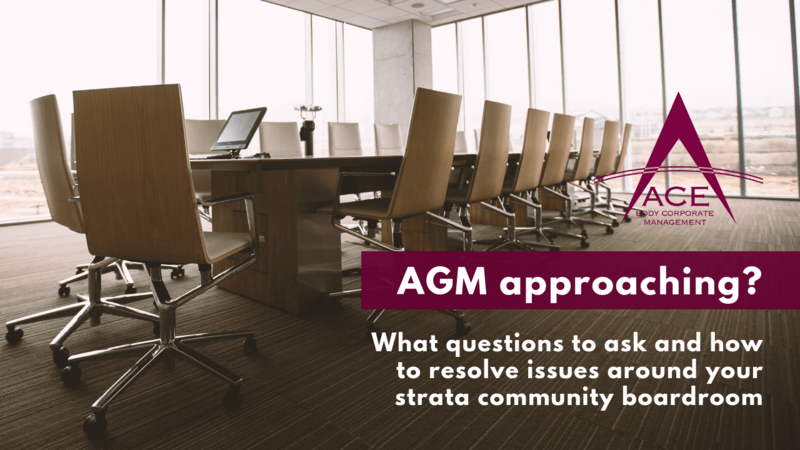 The start of the year can often be the peak period for strata committees to get together and hold their annual general meeting (AGM). If this is your first AGM then you can expect it to start with a run-down of the minutes from the previous year’s meeting. We recommend reviewing a copy of the previous year’s minutes in advance so that you can educate yourself on the issues from the previous 12 months and review how efficiently they were resolved. The meeting will always map out several issues including the finances for the complex which looks at the previous year’s financial statement and plans for the coming year. Levies will be set in this meeting so it’s important that you’re across this information and understand what’s included, because this is where your money (and other lot owners) is going. As the cost of living continues to rise, we understand this part of the AGM will be of particular interest to you and your fellow owners. So, to ensure you can contribute in a constructive way, we’ve listed 4 of the best questions to ask prior to the AGM commencing. We hope these questions will arm you with the necessary information to make a difference in your strata community. Knowing when specific contracts finish can give you the notice needed to research better deals and discuss money saving ideas with your fellow owners. 2. What control (if any) does our developer have over voting? Often developers have rights in your contract that you might not be aware of, including a vote on strata community decisions. Asking this question keeps you in the know and able to voice any concerns. 3. What experience do my fellow committee members have running strata communities? It should be important to you that knowledgeable and experienced people are serving on your committee. Asking this helps sound out what extra information or in fact training your committee may need. 4. Do we have a sinking fund in place? Sinking funds (or Maintenance funds) are a ‘fail safe’ for strata communities set up to cover emergencies and issues where funds aren’t usually available. They’re not mandatory in all states, but they have saved countless owners in recent times helping to cover water damage, cladding inspection costs and more. We think it’s a great idea to question its existence in your community. Finding it hard to agree at the AGM? Strata communities are made up of such a diverse group of people that it can be hard to avoid simple or even major disputes during a meeting. To help you overcome this, here are our tips for resolving any issues at your upcoming AGM. Ensure all owners are well informed on each agenda item before inviting discussion. This ensures that many routine agenda items can be quickly resolved. This is normally controlled by the Chairperson or the appointed Strata Manager. Ensure all discussion is focused on the agenda item at hand, so unrelated matters do not unnecessarily extend the meeting time. Only one person can speak at a time- this can be controlled by the Chairperson or by the speaker raising their hand before commencing speaking. An effective chair will normally summarize what has been discussed before commencing voting. Consider appointing a professional body corporate manager to run an AGM on your behalf. Disorganisation can be a catalyst for disputes at an AGM, and that’s exactly what a strata manager is tasked with helping owners avoid. By having one of Ace’s professional strata managers run this meeting, your community is in a much better place to have a productive meeting. Of course, if you need more than tips, you might want to consider speaking with a strata professional at Ace. Professional management advice can make all the difference in seeing an AGM run smoothly, setting your community up for a great year. To request a quote for professional management in your community, contact Ace on 1300 792 509 or visit our website to find your nearest branch.